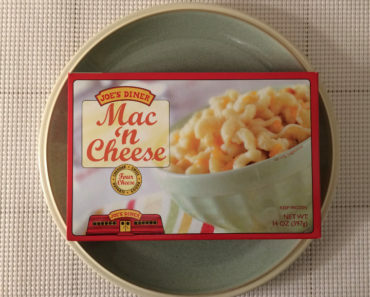 We’ve tried some pretty funky mac and cheese dishes here at Freezer Meal Frenzy, but the Trader Joe’s Shells with Brie and Asparagus is so far off the beaten mac-and-cheese path that it doesn’t even have the words mac or cheese in its title. This is actually a part of the Trader Jacques line, which as far as we can tell just means that this is a French product. 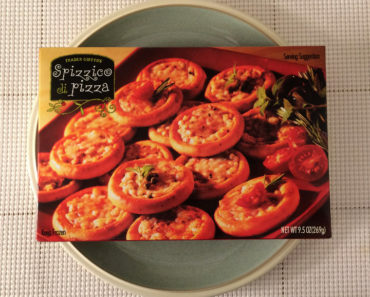 According to the packaging, this meal is “sinfully rich and worth every bite,” so we decided to put that claim to the test by trying some and reporting our findings to all our lovely Freezer Meal Frenzy readers. Now, before we go any further, we need to warn you about something. 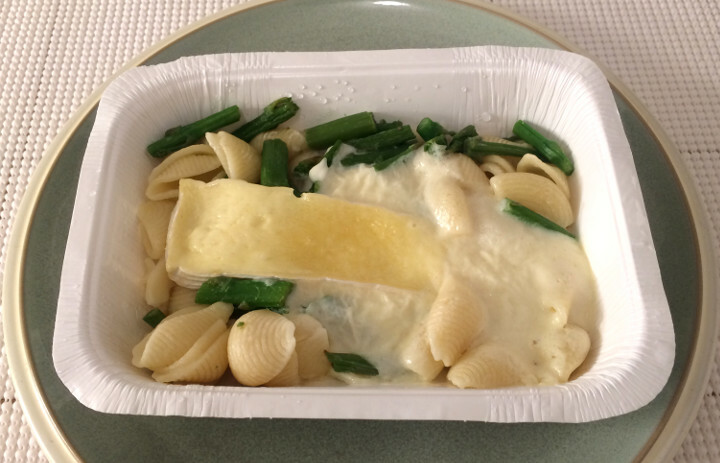 This meal contains a chunk of brie. No, it’s not mixed into the sauce, like any normal person would expect; this thing has a brick of brie just sitting on top of it. And this brie looks like one of those handmade bars of soap you always get talked into buying at the Renaissance Festival. If you’re not prepared for it, this may induce a brief panic. “Who put a bar of soap in my macaroni?” you might find yourself screaming. But before you scream anything — in the process scaring your roommate, significant other, or random neighbor who happens to be walking their dog past your house at the moment — just give this a good stir. It magically transforms into something that looks a bit more normal. 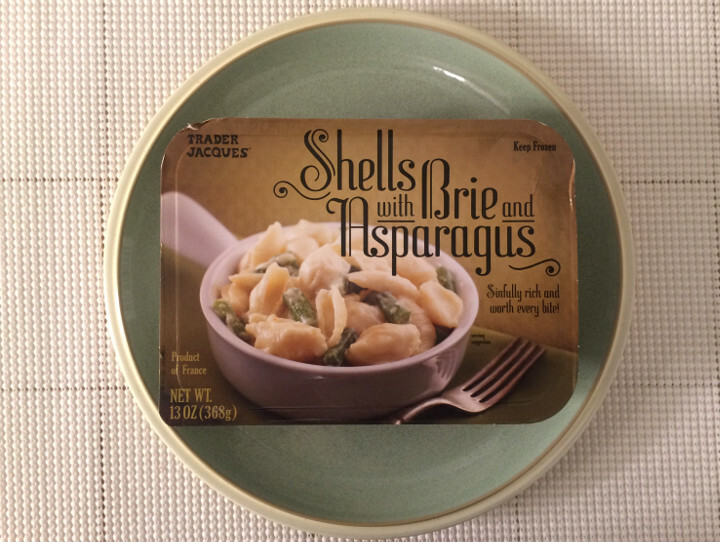 Even so, brie is a weird choice for this dish. Sure, it morphs into a creamy sauce, but it also doesn’t taste very good as a main part of the meal. A cheese sauce with a small crumbling of brie to add those sort of sour, bitter undertones would have been lovely. We’re not sure if this is just a psychological effect of thinking about soap, but this cheese actually kind of tastes like soap. The asparagus doesn’t seem like the right vegetable to pair with this either. 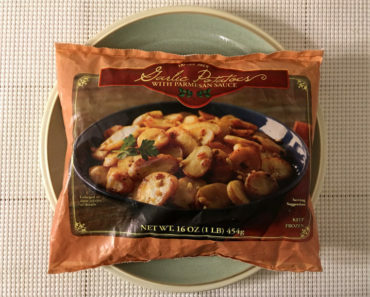 It lends some earthy undertones to this dish, which would have enhanced a better cheese sauce but really only serves to bring the soapy taste to the forefront of the flavor palate. We would have found a good broccoli to be a much better fit here. The asparagus is also not very well cooked. Some of it is fine, but some pieces feel crunchy, like you’re chewing on some twig you found in the woods rather than a green vegetable. And those crunchy pieces taste oddly like pine needles. We do love these shells, though. These are larger than your typical shell, and they pack a ton of cheese sauce inside. With a better cheese sauce, these shells would make for a killer dish. 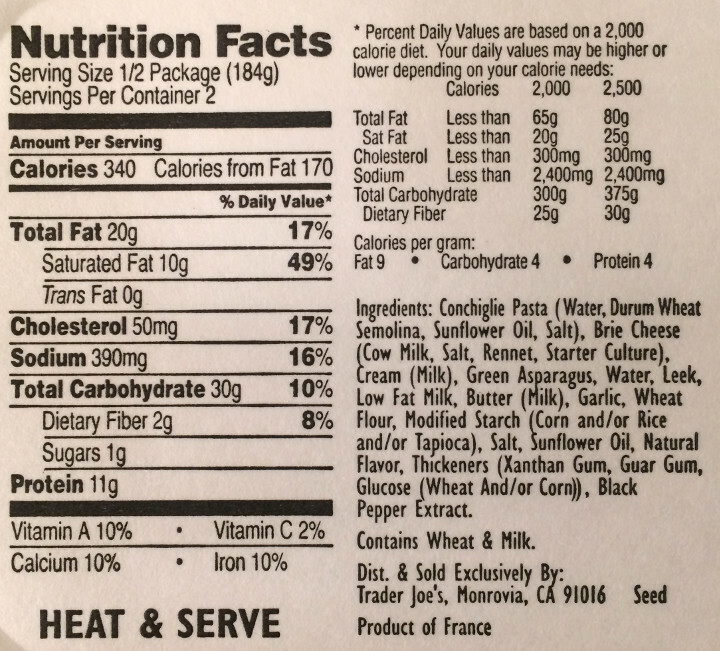 Be careful when you’re reading the nutrition info on the package, because this meal is apparently two servings. 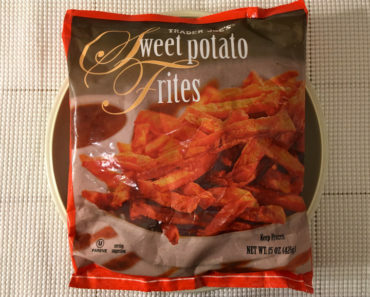 That means it has double the calories listed on the box, putting this up to 680 calories (340 from fat). That is a ton of calories. Of course, this is also lower in sodium than we expected, at 780 mg. 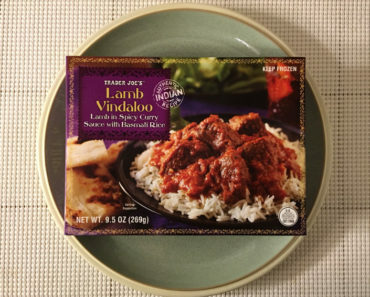 This isn’t a low-sodium dish by any means, but we’ve seen double this on dishes that split their nutrition info into two servings. 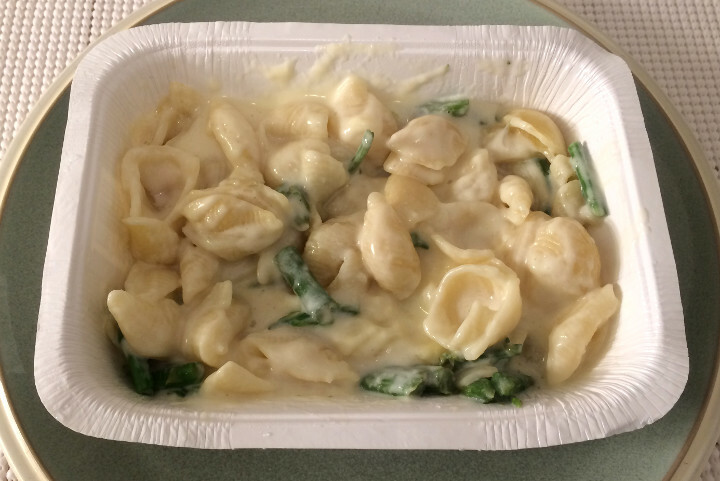 Trader Joe’s Shells with Brie and Asparagus is not as “sinfully rich and worth every bite” as the package would like you to believe. The brie, rather than lending an upscale flair to this dish, only serves to bring it down in every conceivable way. 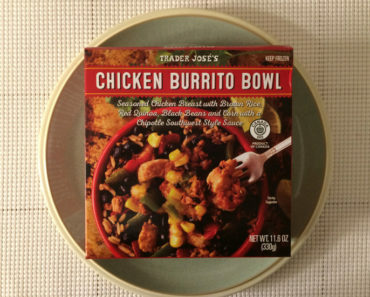 We would have preferred some generic Velveeta-style sauce to this. If you want to learn more about the nutrition content in this frozen food, check out our package scan below.